In this project, we are going to make a Headphone/Audio Amplifier by using self-designed PCB. This project is mainly designed for amplifying the audio signal from the headphones but we can also use it for amplifying the subwoofer or speaker output, just by switching few jumpers. When we use headphones with our audio device like mobile, laptop, FM etc, the power is sufficient for normal user but not sufficient for loud music listeners or sometimes we get very low sound from some devices. So to address this issues, we have made this handy hobby gadgets namely Headphone Amplifier. 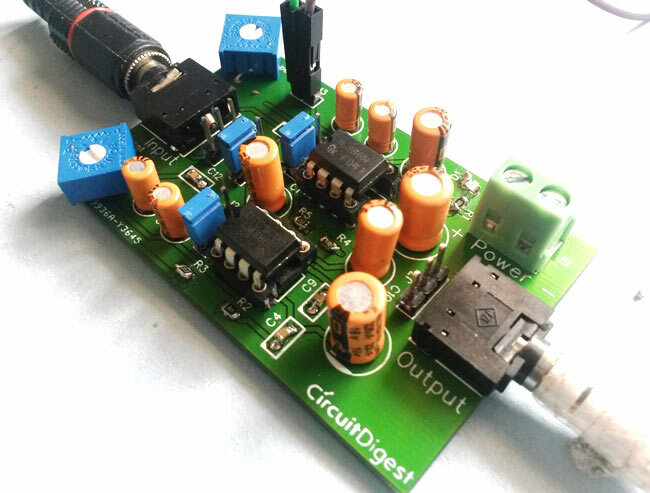 This circuit can also be used as Audio Amplifier to amplify the Subwoofer output and can be powered by a portable battery, so the user can carry it anywhere and it. Check the complete details below. 1. To use it to amplify Headphones output, we can configure the jumpers as shown in below picture, in this case both LM386 ICs work independently for left and right speaker with low gain. User can set the volume for both the speakers of headphones independently by using two given potentiometers. 2. The second case is same as the first one (Headphone Apmlifier), only we get High gain this time. When we configure the jumpers as shown in below picture, then again both LM386 ICs work independently for left and right speaker with but with High gain this time. User can set the volume for both the speakers of headphone independently by using two given potentiometers. 3. In the third case, we can use Subwoofer or Speaker (4 ohm/ 8-ohm speaker) by changing the position of middle jumper. When we configure the jumpers as shown in below picture, then both ICs work in series with Low gain. User can set the overall volume by using two potentiometers. You can also use headphones in this configuration but the volume should be low, otherwise in high volume headphone may damage. 4. The fourth case is same as the third one, only we get High gain this time. We can use Subwoofer or Speaker (4 ohm/ 8-ohm speaker) in this configuration. When we configure the jumpers as shown in below picture, then both ICs work in series with High gain. User can set the overall volume by using two potentiometers. You can also use headphones in this configuration but the volume should be low, otherwise in high volume headphone may damage. For giving audio input to this Headphone/Audio Amplifier Circuit, user need to use AUX cable, which has 3.5mm audio jack at both the side. One end will connected to this circuit and one to the audio source like mobile, laptop etc. At the output end of this circuit, you can either use simple Headphone/earphones or can use Subwoofer or speaker. Remember to configure the jumpers accordingly as described above. Check the demonstration Video at the end, and learn more about Audio amplifying using LM386 here. Also check Simple Audio Amplifier circuit using 555 Timer. You can also access the PCB layouts of this headphone amplifier here. how much volt of this capacitor?????? what is the function of J6 and J7 ? Thanks for explaining each and every detail of the connections with photos. I am thinking about making this as my semester project. How many Capacitors do I need to create the device? Please tell me! I am doing engineering (thapr.edu), I think this would be a great project to display." Can I use lm324 intead of lm386 IC?